With the remarkable clarity and grace that characterize all of his writings, Thoreau describes the ecological succession of plant species through seed dispersal. The Dispersion of Seeds, which draws on Charles Darwin's theory of natural selection, refutes the then widely accepted theory that some plants spring spontaneously to life, independent of roots, cuttings, or seeds. As Thoreau wrote: "Though I do not believe a plant will spring up where no seed has been, I have great faith in a seed. Convince me that you have a seed there, and I am prepared to expect wonders." 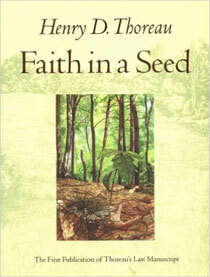 Henry D. Thoreau's Faith in a Seed, was first published in hardcover in 1993 by Island Press under the Shearwater Books imprint, which unifies scientific views of nature with humanistic ones. This important work, the first publication of Thoreau's last manuscript, is now available in paperback. Faith in a Seed contains Thoreau's last important research and writing project, The Dispersion of Seeds, along with other natural history writings from late in his life. Edited by Bradley P. Dean, professor of English at East Carolina University and editor of the Thoreau Society Bulletin, these writings demonstrate how a major American author at the height of his career succeeded in making science and literature mutually enriching.